At the moment, Skye wants to be an Electrical Engineer, Ava wants to be a Mechanical Engineer and Gracie want to be 'a teacher who is very good at Art'. I think the Engineering slant is coming from all this Hydro activity. Who knows? But the most fun is to be had sliding down the tailpipe. The Mackenzie girls, or 'The Ferals' as we know them, check out the digger bucket. And here is what the pipe looks like. Major ground works. I think we might need a book on Engineering next, explaining the different types of Engineers and what kind of jobs they get involved with. More activities at Kids Educational Books base camp. It's a far cry from the IT days or even book writing. With over three years in the planning, we are now full steam ahead, developing a new Hydro Electric Scheme. Really, it's been a year since I updated this. Note to self to try harder. If there is any defence, I have many jobs but really, a year is way too long. What was that we were teaching kids about a good work ethic, sticking at the job and so on? I have been working on a new book trailer but in the meantime, here's a little update from Kids Educational Books base camp. Firstly, Crofting. Here's a picture to cheer you up - this year's calves. We have pedigree Highlanders crossed with a Shorthorn bull. 22nd June 2015 - Who would have thought? I hadn't thought about using the books to teach English but the international market has proved to be extremely popular. They are being used in Primary School as you might expect but also as a reading resouce for adult learning. It seems that the jobs interest the adults as much as the kids and because it's written for the 5-10 year olds, the vocabulary is reasonably easy. I originally wrote them to try to prepare children for a sensible Careers Advice discussion and ultimately gainful employment but it is delightful to hear that they are of use overseas. 25th March 2015 - Book six is on its way! I've just finsihed going through the entries for SAW's under 7's short story competition. Brace yourself because is an unbelievable talent in this country coming through! Well done to all the writers - your stories were an absolute pleasure to read. Winners to be announced at the end of the month. "They are really informative and I’ve certainly learnt a thing or two as well, plus they are very well illustrated with photographs. In fact, I am planning to get hold of the rest of the series because I’ve been so impressed with them. H has really enjoyed them too and has said that they are ‘really interesting’"
A snippet from Pocketful of Rye who have reviewed all 5 books in the 'What do' series. A massive thanks to them for taking the time to review! "The What do series has sparked a different sense of fun in the children reading them. I am convinced that the author, Mairi McLellan, should be given an award for her intuitive books. They are simply wonderful for reading aloud to children at bedtime, or for keeping them occupied while driving. In my view, the last person recognised as being able to captivate children by the use of a simple device was Steven Spielberg. When he created the film about E.T., he placed the cameras at the same height as most children’s’ faces, thus he was relating to children at the same relative height. 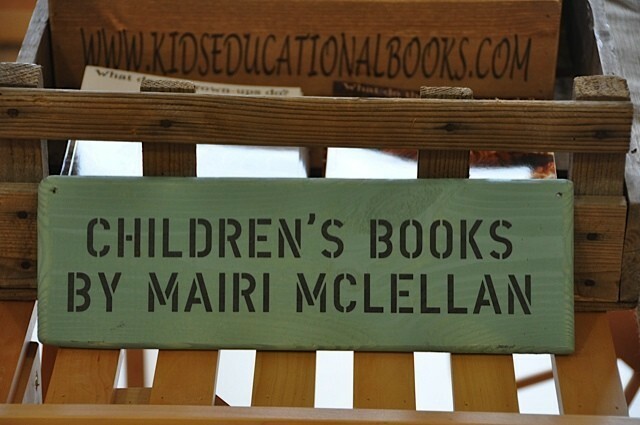 Mairi’s methodology is not dissimilar, as she writes the contents of each of these delightful books as though they were being viewed from a child’s perspective. That is their outstanding secret. I cannot wait to read the next set of charming ‘adventures’ of the Mackenzie children. In these days of increasing complexity and technological pressures, it is a sheer delight to have something as precious as these books to relate with to the children. 28th October 2014 - Happy Publishing Day! 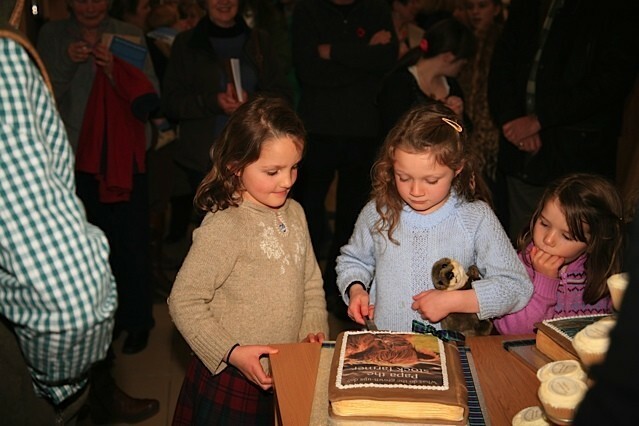 October 2014 - Moonbeam Awards! What do the grown-ups do? just won 'Best Book Series - Non-Fiction' at the Moonbeam Children's Book Awards in the US! Next reading Thursday, 1st May at Muirton Primary School, P3. We will be focusing on Papa the Stockfarmer as the kids are learning about farms and animals. In addition to learning about what stockfarmers do, I have a story of our little calf who survived a leap off a cliff into a river at 11.30pm at night and was rescued by a passing boatman! New audio extracts are now on this website for Joe the Fisherman, Papa the Stockfarmer and Sean the Actor. These were produced and aired by children's radio station, Abracadabra, who have done a wonderful job! Songs for Amy coming soon to the cinema! Feature film, 'Songs for Amy' outside The Screen Cinema, Dublin. Premiere on May 1st! So exciting! My sister, Fiona Graham and one of our best mates, Konrad Begg have finally got their film to the big screen! It's a terrific film - kind of a cross between The Hangover and The Commitments. I love it. All the actors did an amazing job and for those of you who see it, you will recognise 'Sean the Actor', book 3 of the 'What do the grown-ups do?' series. Good luck team - if it goes well in Ireland we can hopefully get to see it in the UK & USA. The Advanced Information (AI) is now available for Fiona the Doctor (book 4) and Richard the Vet (book 5). If you would like me to send a copy, please get in touch. Publication date for both books is 28th October 2014. I am new to all of this writing business and there have been some challenges along the way, as with most start-ups. One of these was my printing costs, which were exceptionally high. As a result the books had to be priced at £10. Since then, the publishers have found a cheaper printer and so books 4 & 5 will be £7.99. Ultimately the whole series will be £7.99 but for those already printed I am unable to make changes. Some think £10 is fine, some think it is expensive. In any event, I'd like to let you know that any efficiencies and cost reductions we can make will be passed onto the customer. See the reviews/press section for more reviews. Lots more reviews coming in - please see the Reviews/press section. Here's one just in from http://madhousefamilyreviews.blogspot.co.uk. We're officially at the end of winter, which is hard to tell by the snow on the hills! It's all going tremedously well in the world of books. Reviews have been great (thanks! ), ebooks have been fixed and Fiona the Doctor & Richard the Vet are finished with publication date 28th October 2014. Is it a lamb or a calf? Next books will be £7.99, plus discount to all Troubador buyers! From Book 4, Fiona the Doctor, onwards will have the new price of £7.99 and once the first editions are sold out, I'll be able to charge all books in the series at £7.99. Phew. Oh, and if you buy your books through my publisher, Troubador, I can offer a 20% discount. Happy days. Happy official publication date for Joe the Fisherman and Papa the Stockfarmer! You can now get them online and in the bookshops! Sean the Actor has arrived! Books 3, Sean the Actor has just arrived on my doorstep this morning and looks great! It's not published until 28th April so will not be availabe for purchase until then. Sean's book is a great contrast to the more rural jobs that I am working on and provides a good balance to the series. He's a terrific chap and he has some words of wisdom for all those kids wanting to know what it is like being an actor. Thank you Sean! A massive thank you to all who have reviewed the book! I am SO unbelievably pleased with the feedback coming from all parts of the country and couldn't have hoped for better. It is very much appreciated to all who have taken the time to read them and it is great to see the kids enjoying them so much! THANK YOU!! Agggg! It was all going so well. I've now got an ebook fiasco. Just managed to download the ebooks onto ipad & kindle to check them and what a mess! It's an embarassment. After all this work to get the books to a high quality, the ebook conversion lets it down massively. I'm speaking to the people who converted it to see if it can be fixed but if it can't, it will need to be removed. Captions not beside text, photos missing, searches on titles not working, surname missing, hyphenated words across different pages and generally very poorly formatted with nasty spaces, randomly placed. Onwards and upwards folks. This will be fixed. I will report back with an update. The first resources are now available to download free of charge. Resouces for Joe the fisherman can be found here. Each book will be accompanied by its own set of exercises for the children. Within each resource are comprehension exercises, as well as many other areas that relate to the book. For example, Joe the Fisherman covers comprehension, geography, marine life and navigation as well as creative sections, where children use what they have learned to draw pictures. The exercises are interspersed with facts containing useful, practical tips. Happy new year! It's belated, I'm sorry, but it has been busy. The festive season was its usual - exceptionally good fun, but quite frankly I'm delighted to be back to work! I'm in London having met with publicist, Jacqui MacCarthy from D'Image (lovely, clever lady) who will join the Kids Educational Books team, focusing on PR. I'm very much looking forward to working with her. We've had lots of chats over the past few months and it is now action stations as the publishing date gets closer. It's going to be fun! Wishing you all a truly fantastic 2014! Papa the stockfarmer is now available in ebook from Amazon. It is available from both Amazon.com and Amazon.co.uk. Joe the Fisherman ebook is now available on Amazon. 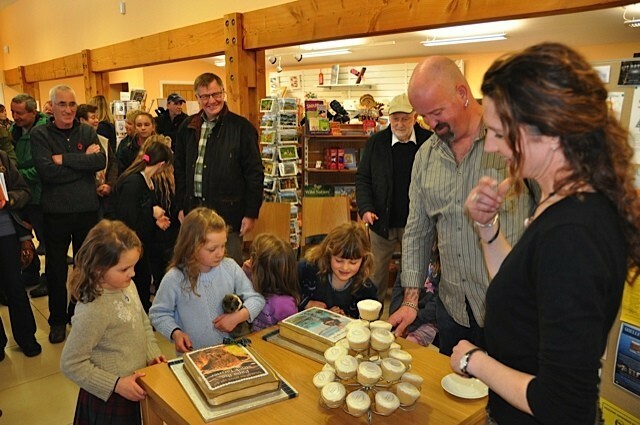 Although the books won't be published until 28th Feb, we've had over 400 books sold since the local launch. Thanks to all for the support! It all finally came together on Saturday. 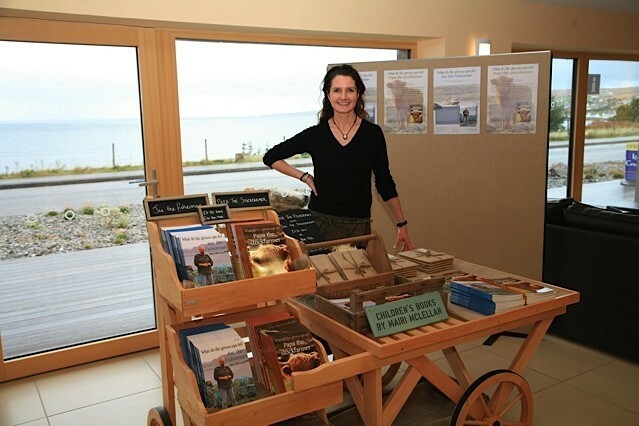 Here's my stall set up in the local tourist office where we had the launch. Such a great day! We are lucky to have such a fab community. A great milestone in the McLellan world of books! 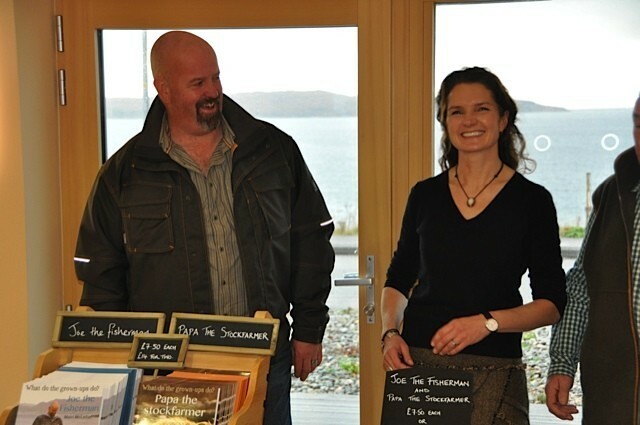 Today was my book launch and it was a cosy local event which couldn't have gone better. Thanks so much to all who joined me and to my helpers - Mum, Yolanda, hubby and of course to Joe the Fisherman and Papa the Stockfarmer who were the stars of the show! Happy days. The books arrived and they have done a great job at the printers. 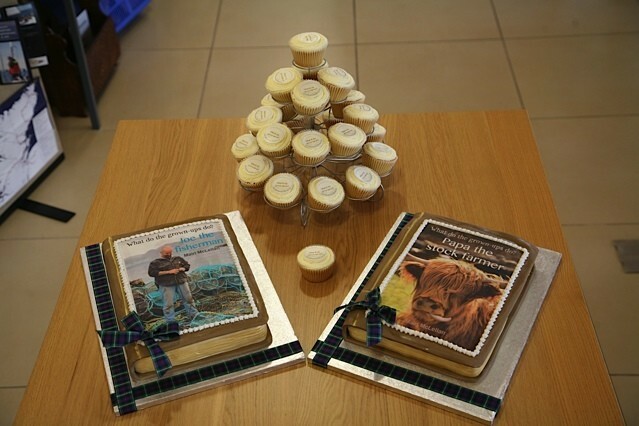 What a relief to have books for the book launch! My folks have come up to join me - lovely to have the family here. Book arrival is IMMINENT! VERY excited, also nervous. Have my new book display stall set-up in the garage which is looking ace, if I may say. 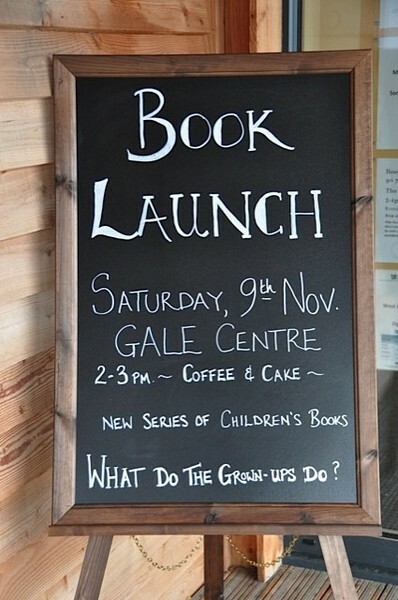 19th Oct, 2013 - book launch! I am refreshed and fully rejuventated after our trip to Tiree (thank you Jo for lending me your helmet!). I love windsurfing but I really don't do it very often so it was great to get in the water and get some decent winds! The books are in the printers and it's all systems go, focusing on the local area and writing the next books. Everything is much more organsied and I'm feeling like we are vaguely on top of things! I am having a local book launch on 9th Nov, which will be small and informal, with both Joe & Papa attending. I'll be having others next year at some point, which I will provide details for, but this is just a nice cosy event with the local people. Time for some tea and cake! 16th Oct 2013 - NEW PUBLISHING DATES, MOVED TO FEB! They say the path of true love never runs smooth but I would suggest that the path of publishing is a rougher ride! (no pun intended). The books will not make the 1st Nov deadline so I've pulled them back. Publishing any later than 1st Nov means I'll miss the Christmas market and with January being quiet, my first opening is 28th February. So that's it. Joe the fisherman and Papa the stockfarmer will be published in Feb. There are two silver linings to this little fiasco. Firstly, I will have the books here, which means I can do a local book launch and get round the bookshops and schools in my local area. This means that by the time I actually publish, I'll be able to focus on more national PR and school visits elsewhere. Secondly, there will be la smaller gap between theses two books and the third book, Sean the Actor, who will be published on 28th April 2014. It should mean that the series will run more quickly from a consumer perspective. p.s. We've just returned from an ace holiday on Isle of Tiree. I was SO proud of my little ones starting windsurfing! Well that's it. The year is evaporating. Most importantly on the books side, the month is evaporating. I like to think I'm pretty easy going generally (my husband may disagree!) but I am v stressed about getting these books in time. Well quite frankly, they are not in time. 1st Nov is publishing d-day for Joe & Papa, and I should have had them last week for my PR, local book launch, planning etc. Everything is ready to go....I just need the books! I'm stressing about a)getting them in time, b)whether they will look ok and c)whether I have missed any mistakes. I can't imagine how authors of longer books get by! I take my hat off to them. This is the first draft of the Papa poster. The little Highland calf is so cute! This photo was actually takem by my lovely friend, Marc Turner. He is a professional photographer and has a great eye. Whilst I like the photos in my books, his are in a different league! He gets amazing depth. It's just a different class. Note to self to get some photograhy lessons when I get some spare time. It's all happening. I have no idea how many posters I'm going to need but I know I'm going to need some. What size? A3/A4/A5. I've deisgned this mock-up poster for Joe. I quite like it and think it gets the atmosphere across. It still needs tidying up but Joe's boat looks fab charging into the bay! I've been franctically proof reading lately. Depsite two external proof reads, a lot of help from family (thank you!) and reading it myself about thirty times, I have still managed to find 2 pages of errors! Deeply worrying sending this off to the printers for 2000 copies. PLEASE let there be no more mistakes! Can you imagine the embarassment? I'm afraid patience has never been my strong point. I finished Joe the fisherman in January but there have been some delays at the production end, so the publishing date has moved to 1st November. Onwards and upwards. Better to have it completlely correct than otherwise! In the meantime, Fiona is pleased with her book so that is good news. I have some minor changes to make and then I can send it off for production, which means roughly a 1st May launch. Ideally I'd like to launch one every three months. There is a bit of juggling to do between managing the farm, boat charter and holiday lets but I'm aiming to have 5-6 books published by end 2014. Its all very exciting. I've just finished writing Fiona the doctor. It's been quite challenging to find the balance on how much to simplify some of the concepts. The terminology is not child friendly! However, I've stuck to the aim of the books, which is to maintain reality whilst making light of difficult concepts and long words. The first draft has been send to Dr. Fiona for review. I do hope I have not made too many mistakes! Meanwhile, I'm off to start Richard the vet - loads of great photos! It's been a busy few weeks. As well as writing books, we seem to have various start-ups on the go at the same time, which makes for never a dull moment. What was supposed to be a solid day of book writing was hijacked by farm admin, so it will be a late night catching up. That's not a complaint, I enjoy it immensely, and it doesn't feel like work as I used to know it! The interviews with Fiona, Richard and Gordon were amazing. I'm writing children's books but I am learning so much along the way. It's such a great job - meeting people, writing, taking photos and working on the commercial side. I need to start planning some school visits to meet the children and do some readings, answer questions, and so on. If you'd like me to visit your school, please drop me a line. The first two books of the series, Joe the Fisherman and Papa the Stockfarmer, will be published by Matador and released 1st October 2013. Sean the Actor will be released soon after hopefully 1st December 2013. I'm planning to go around some schools and talk about the different books, meet the children and get more feedback. If anyone has specific requests for s school visit please get in touch! School visits will take place as soon as the books are published from 1st October onwards.